Mobile World Congress was everything it promised to be—the largest mobile event on the planet. A place where business minds from some of the world’s most influential companies come together to learn about emerging trends, stay abreast of the competition, and change the future. From the moment I arrived in Barcelona I knew this was something big. The city was buzzing. Crowds poured onto the streets. Public transportation was overwhelmed. The aura of commerce filled the air. Now in its 10th year, MWC15 was the biggest yet drawing over 93,000 attendees from 200 different countries and 2,100 exhibitors who showcased the latest in mobile technology, devices, M2M connectivity applications and solutions, mobile apps, wearables and more. With an estimated one billion M2M connections expected by 2020, it is no surprise that discussions around the M2M market and its expected growth were prevalent on the show floor this year. According to GSMA, applications with a requirement for low power and low data transmission present a significant business opportunity to this industry, particularly in utilities, smart city and agriculture applications. Mobile World Congress was all about connectivity. Customers want access to the right information at the right time in order to run smarter operations. M2M technologies will continue to play a key role in the mobile market as they provide a platform for enabling companies to improve operational efficiencies. 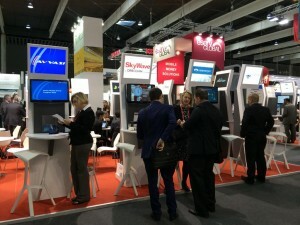 With a new, combined M2M portfolio that includes everything from devices and applications to airtime over the cellular and satellite networks, SkyWave, an ORBCOMM company, surfaced to the top at MWC as a key provider of comprehensive M2M solutions for tracking, monitoring and controlling powered and unpowered assets anywhere in the world. Did you visit Mobile World Congress last week? Share your experience with us below.